Naturally Smart Labs is dedicated to using only the finest soap making ingredients to produce high quality soapmaking bases. All melt and pour glycerin soap bases are produced in our state of the art facility located in Brecksville, Ohio - Made in the USA. Naturally Smart Labs Glycerin Melt and Pour Stock Soap Formulas include: Extra Clear, Ultra White, Goat Milk, Shea Butter, Cocoa Butter, Oatmeal, Honey, Olive Oil, Low Detergent, and Detergent Free. 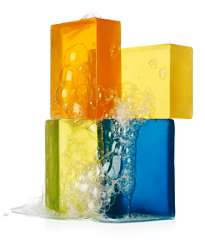 We produce a variety of custom soapmaking formulas based on specific client requirements. Production sizes include 12 oz tub, 1 lb tray, 2 lb tray, 5 lb tub, 10 lb tub, and 24 lb bulk blocks.